And after weeks of complaining about the Gift Christmas tree, not a word. And Valentines day event, eh? I've sure gotten a lot out of the Dev diary detailing (and usually poorly) the event - oh wait, there hasn't been a Dev diary. I'm sure glad they made a grammar fix - that was keeping me awake at night. And since I didn't see anywhere else to post it and I didn't want to start a new thread, I have to mention the "Infrastructure Maintenance". What infrastructure? Are you changing the batteries or something? It just so happened it is right in the middle to end of a nice Holiday in NZ, I was all set for a day of gaming to get up and find out I only had a matter of hours. When the game is scheduled to be back up it will be bed time. Now that is nobody's fault and in a global game that's just the way the timing goes so there's nothing to be done about it but that doesn't take away from the annoyance. BUT what I can't get past is why does it take so many hours to accomplish something in an environment which only makes money if it's available? Someone doesn't have things organized very well. I play other online games and outages are very rare and when they occur are 15-30 minutes. I find it stunning that in the modern age that it takes so much time to do things and there is no way apparently to do anything while the system is live. Real companies do real hot-fixes you know (not what BB calls a hot-fix... the services are still available). I'd give anything to know exactly how this infrastructure is laid out because I know if in my company there was an 8 hour outage people would riot and heads would roll. Tried to log in to shut off the 26 buildings my christmas market buffed this morning, so they'll be running for another 12h unbuffed and a gold mine may run out. Thanks for the lack of notice. And, no fixes to the broken christmas tree? Or the increasing number of erroneous popups that then kick us out of the game? Maybe in the future we can mix standard troops with elite troops. So we that are at 54-58 lvl can use the elite. Last edited by cat_flap; 06.02.19 at 11:34. "When applying a buff to the Provision House, running productions should no longer display the buffs runetime instead of the production time"
Is this fixed on combat academy too? 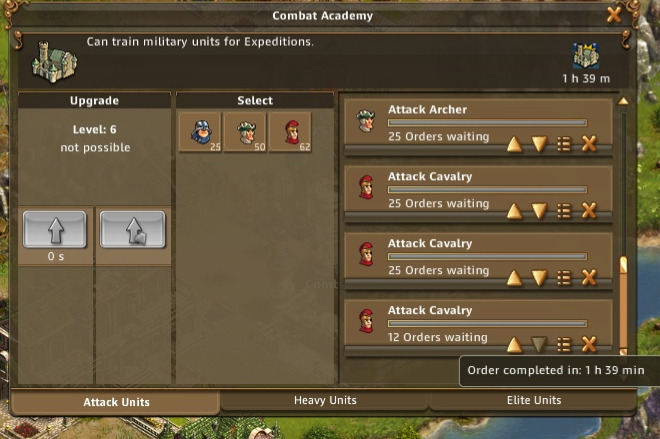 You can - it just needs to be different generals. If you mean in the garrison of the same general to have both types I suggest this wasn't done because the UI would have to change so much more and they didn't want to take that on. It was easier for them to code the 'switch troops' thing as annoying as that is for the players.